REITs are an excellent way to get growth and income in your portfolio. Here are five great choices. Investing in stocks that pay high, safe dividend yields and also have potential for growth is perhaps the most surefire way to get rich in the stock market over time. One sector that is loaded with this kind of stock is real estate, but not all REITs make excellent long-term investments. Here's what to look for when choosing REITs, and some of the best choices going into 2017. 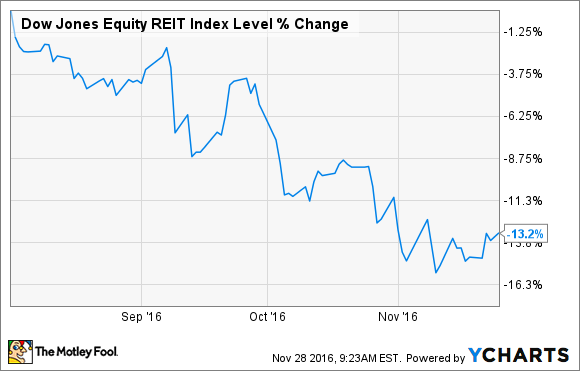 Why have REITs fallen in the latter half of 2016? You may have noticed that REITs haven't exactly delivered outstanding performance in recent months. The Dow Jones Equity REIT Index has fallen by more than 13% since August, and many big names in the sector have fared even worse. In a nutshell, this is due to the widespread expectations that we're entering a period of rising interest rates. This is bad for REITs for two main reasons. First, it makes it more expensive to borrow money, which translates to narrower profit margins on acquired properties. Second, higher interest rates make less risky income investments, like Treasury bonds, seem more attractive to investors, which creates selling pressure on REITs as investors move money into "safer" investments. Chart is the author's own work. Dividend yields are current as of 11/28/2016. 1. Realty Income -- Realty Income specializes in freestanding net-lease retail properties, mainly occupied by tenants with little threat of online competition, and that are not terribly recession-prone. Examples of Realty Income's properties include drug stores, gas stations, movie theaters, dollar stores, and warehouse clubs. 2. Digital Realty Trust -- Digital Realty owns and operates data center properties all over the world, and leases them to tenants such as IBM, Facebook, and JPMorgan Chase, just to name a few. The company has done a great job of capitalizing on the rapidly growing need for data storage, and the industry is expected to keep growing at a double-digit rate for the foreseeable future. 3. HCP, Inc. -- HCP specializes in healthcare properties, and just completed a spin-off of its skilled nursing properties. Now the portfolio is composed of senior housing, life science, and medical office properties -- the vast majority of which are stable, private-pay assets. The healthcare real estate market in the U.S. is highly fragmented and expected to grow rapidly in the coming decades, which translates to plenty of growth opportunities for companies like HCP. 4. AvalonBay Communities -- AvalonBay develops and owns apartment communities located in certain "core" markets on both coasts. The company's apartment properties are in markets with expensive housing and a large concentration of renters, and the demographic trends point toward the continued success of AvalonBay's business model. 5. Public Storage -- We all know those big orange storage buildings. Public Storage is the clear industry leader in the self-storage business, larger than its next three competitors combined. In addition to the cost advantages that come with being an industry leader, self-storage facilities are a relatively inexpensive form of real estate to operate. In fact, Public Storage has said that it can break even with its storage facilities just 30% occupied (they are currently well over 90%). You'll notice in the disclosure section below that I already own four out of five of these in my personal portfolio. In the interest of full disclosure, I've added to several of these positions over the past few months (specifically Realty Income and Digital Realty), and I continue to look upon the current environment as an excellent buying opportunity in all five. There are several reasons why industrywide and company specific REITs could go down. One major risk factor to be aware of is interest rates, as I discussed earlier. There are several other risk factors to be aware of, many of which are company specific. For example, we could see a surge in first-time homebuyers, which could negatively impact AvalonBay's occupancy rate. Or, one of Realty Income's major tenants could go bankrupt. However, with the high-quality REITs discussed here, any negative catalysts are likely to be short-term inconveniences and not long-term problems. In all five of these REITs, I would view any price weakness as a buying opportunity.